WASHINGTON, DC, December 22, 2010 (ENS) – This week, the Obama administration has finalized loan guarantees worth nearly $3 billion for two of the largest renewable energy construction projects in the world. Energy Secretary Steven Chu announced Monday a $1.45 billion loan guarantee for the world’s largest parabolic trough concentrating solar plant, sited in Arizona. On Saturday, Secretary Chu announced that a partial loan guarantee for a $1.3 billion loan had been finalized to support the world’s largest wind farm, located in eastern Oregon. Located 70 miles southwest of Phoenix, near Gila Bend, Arizona, 250-megawatt Solana project is the first large-scale solar plant in the United States capable of storing energy it generates with a thermal storage system using salt. 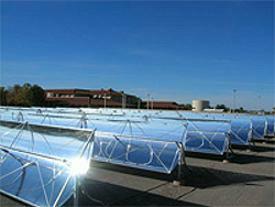 It will be built by Abengoa Solar Inc., a Spanish company. U.S. providers and manufacturers will supply 70 percent of Solana’s components, such as mirrors, receiver tubes, and the heat transfer fluid. To accommodate the project’s need for over 900,000 mirrors, a mirror manufacturing facility will be built outside of Phoenix. “As the world’s largest solar plant of its kind, the Abengoa’s Solana project is playing an important role in creating jobs and clean energy for Arizona as well as fostering innovation in the U.S.,” said Secretary Chu. Electricity from the project will be sold through a long-term power purchase agreement with Arizona Public Service Company. Solana will produce enough energy to serve 70,000 households and will avoid the emissions of 475,000 tons of the greenhouse gas carbon dioxide per year compared to a natural gas power plant. Abengoa Solar signed a power purchase agreement with Arizona Public Service Co., Arizona’s largest electric utility, to buy the energy produced by Solana for a period of 30 years. The other federal loan guarantee supports the Caithness Shepherds Flat project, an 845-megawatt wind generation facility in eastern Oregon sponsored by Caithness Energy, LLC and GE Energy Financial Services. 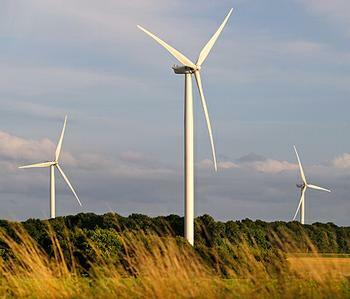 The 338-turbine project is being developed on 30 square miles near Arlington, Oregon using GE 2.5xl wind turbines, which are designed to provide high efficiency, increased reliability, and grid integration. The 2.5xl turbine has a rotor diameter of 100 meters – or about the length of a football field. The wind farm is the first in North America to deploy these turbines, which are used in Europe and Asia. Once completed, Caithness Shepherds Flat will sell 100 percent of its power and the renewable energy credits generated to Southern California Edison under 20-year fixed price power purchase agreements. The company projects that operation of the wind farm will avoid more than 1.2 million tons of carbon dioxide a year – equivalent to more than 200,000 cars. The wind farm will directly employ 400 workers during construction and 35 workers during operation, according to company estimates. Both loan guarantees are financed by the Obama administration’s economic stimulus bill, the American Recovery and Reinvestment Act of 2009, which was enacted soon after President Obama took office. The loan guarantees brought smiles to the faces of the elected officials representing the areas where the renewable energy projects will be built. The Energy Department has issued loan guarantees or offered conditional commitments for loan guarantees to support 16 clean energy projects totaling nearly $16.5 billion. Together, the 16 projects total over 37 million megawatt-hours of capacity, which will produce enough clean energy to power over 3.3 million homes.